Thank you for your excellent presentation to us last night. It was well received and we were happy that many people stayed on to chat afterwards. 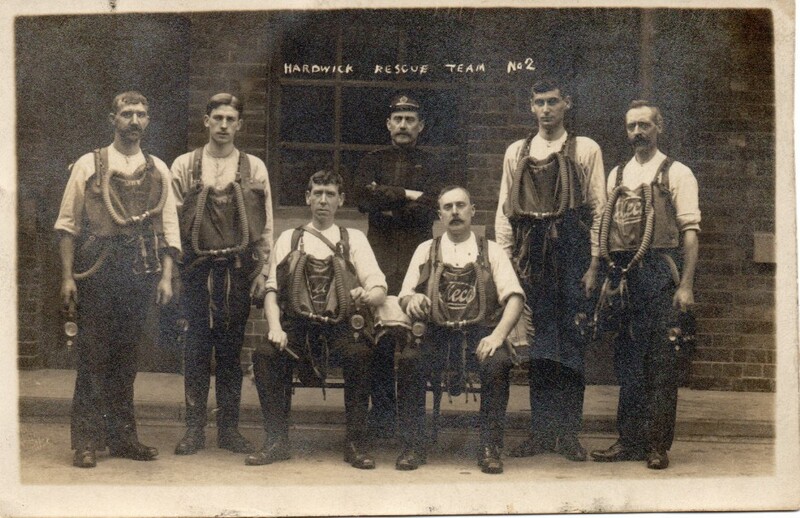 As promised, I am attaching the photo of my maternal grand-father, George Barrington Knowles, in the Hardwick No2 mines rescue team. He is seated on the right (wearing a mustache). George was born in Selston in 1876 and died in 1945 in Hasland. In between he lived in Holmewood and worked at Willimathorpe I think, but there may have been others. He was a deputy. Please feel free to use and share the photo as you wish on the understanding that it is for non-commercial purposes only.If you ever find out who the other people were, please let me know. This photo is also on the healeyhero web site under the same conditions. As I stated on Thursday, the more these old photos are spread around the less chance there is of them disappearing in the future.